Aloha and welcome to week 11. This week’s photo is a peek at Polihale Beach, the furthest point from the end of the road past Kekaha. 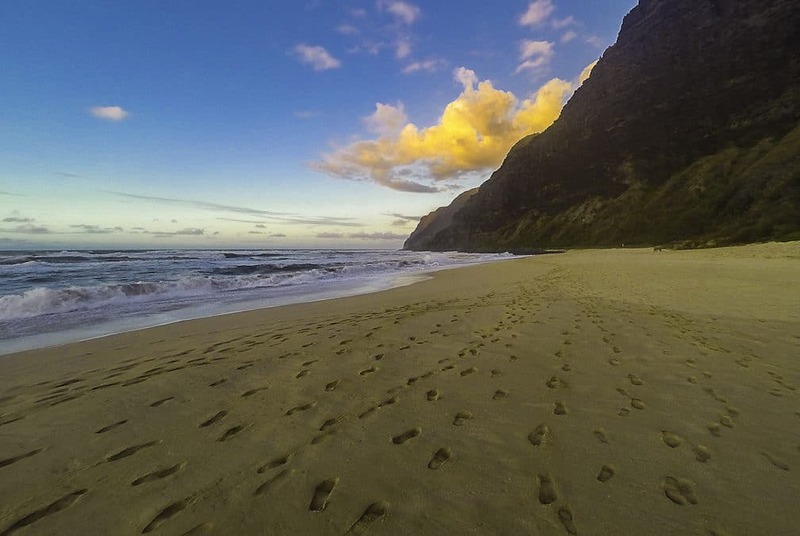 Polihale is over 15 miles of beautiful white sand beach, the longest in the state of Hawaii, reached after a 5 mile dirt road. It is not easy to get to, depending upon the road conditions, but is rarely impossible (the last time I remember the road closed was about 8 years ago?). As you approach, the dirt road forks, the left takes you to Queen’s Pond, the safest place to swim; the right goes toward the cliffs where you’ll find restrooms and picnic tables. Camping is allowed in every area with the proper permit. Polihale is an amazing place, but has several drawbacks for those looking to spend a carefree day at the beach. Riptides, strong currents and dangerous beach breaks can easily overwhelm swimmers, and although safety tubes are posted there are no lifeguards. No potable water is available and the last place to get food is in Kekaha. People in distress, or stuck in the sand, can usually find help, though, due to the generous nature of the locals. But do not go unprepared – bring plenty of water and an umbrella, and do not drive on the sand if you don’t know how. Shelling is popular on this beach, and sunsets over Niihau are breathtaking. 100′ sand dunes provide places for exploration. Camping over long weekends or school breaks is a family activity. Polihale gets its name from ‘po,’ underworld, and ‘hale,’ house. Hawaiians believed this is the spot where souls departed for the realm of the gods. If this is your first visit to the Kauai Photo Challenge, it is my way of sharing my pictures of Kauai while learning more about this beautiful island where I live. You are welcome to comment or share your own pictures. Check out Week 10 of my challenge. If you’re on Kauai, stop in at Creative Ohana for beautiful prints of the island from Kauai Adventure Photo, along with many other types of local artwork.